A brief overview about the basics of timers and their impact on capsuleers in empire space. The Retribution expansion introduced a new and improved timers system called Crimewatch 2.0, which greatly improve upon the previous one by getting rid of the Global Countdown Timer and generally streamlining the system via the use of specific flags. It's very important to be aware of and understand what the different timers mean and what the implications are in terms of legality. Timers can easily wreak havoc in the fleet causing issues with rules of engagements and remote assistance. See CCP's support page on Crimewatch for more details on the more intricate mechanics of legal timers. The following timers have no direct impact on the legality of actions, but serve as a consequence for your actions. Keep in mind that the capsuleer log-off timer can indirectly cause legality issues if you are also at war. The non-capsuleer log-off timer is created when you either shoot or get shot by an NPC. This means you will remain in space if you disconnect or close the client, until the timer runs out. The NPC timer will not be renewed if you are shot while already having disconnected or logged off. Cause: Combat with another capsuleer. Consequence: Ship will remain in space on log-off until timer expires (15 minutes). The capsuleer log-off timer is created when you either shoot or get shot by a fellow capsuleer. This means you will remain in space if you disconnect or close the client, until the timer runs out. The timer will be renewed if you are shot while already having disconnected or logged off. So if someone finds you after you logged out they can keep your ship in space indefinitely. When your corporation or alliance is at war, the capsuleer log-off timer becomes deceptively dangerous in mixed fleets, see while at war for more details on that and other limitations of remote assistance. Cause: Using offensive modules against another capsuleer or activating a bastion or command burst module. Consequence: Unable to jump, dock or eject from, store, refit or switch ships and prevents tethering (60 seconds). You get a weapon timer whenever you use an offensive module against another player (including webs, painters, damps, scrams, points, turrets, missiles, drones etc). This effect also happens when using a bastion module on a marauder (but not for other siege-like modules) as well as activation of command burst modules. Unlike the capsuleer log-off timer, you do not get this flag simply by being shot by another player. This timer behaves differently depending on what kind of offensive action you're taking. An immediate action such as firing a volley with your turrets or missiles as well as drones firing will instantly start the 60 second timer from the moment of the cycle starting. It would then re-initiate for each cycle, but at the start of the cycle when you activate the module. Modules with persistent effects such as webs, painters, damps, scrams and bastion mode, will both start the weapon timer upon activation as well as keeping it at 60 seconds for the duration of the module and won't start counting down until the cycle and effect is gone. The Command Burst module is an exception to this; it starts the weapon timer upon activation and will disappear at the end of the cycle and long before the burst effect dissipates. While this timer is active you cannot change sessions, which means you cannot jump, dock or eject from, store, refit or switch ships. You also cannot be tethered by Upwell Structures such as Citadels or Engineering Complexes as long as you have a weapon timer. Remember that your onboard safety settings allow you to set your safeties in such a way that you can never accidentally go suspect or criminal. The following timers directly determine whether or not you are a legal target. Cause: Committed a "suspect"-level offense. Consequence: Capsuleers may freely engage (15 minutes). The suspect timer means that anyone can freely attack you without CONCORD interfering. If someone engages you, a limited engagement timer is created between both of you, to allow you to shoot back at the aggressor. This causes issues with assistance however, due to interfering with a limited engagement (for more information, see limited engagement below). Cause: Committed a "criminal"-level offense. Consequence: Capsuleers may freely engage. CONCORD will engage in high-sec space (15 minutes). The criminal timer means that anyone can freely attack you without CONCORD interfering. If someone engages you, a limited engagement timer is created between both of you, to allow you to shoot back at the aggressor. This causes issues with assistance however, due to interfering with a limited engagement (for more information, see limited engagement below). Being a criminal means that CONCORD will engage and kill you in high security space. The response-time of CONCORD depends on the security of space, anything between a few seconds up to half a minute. During that time, while piloting a ship with a criminal flag you'll be unable to enter warp, jump through gates, dock up in stations, eject from, store or switch ships. Those restrictions are lifted once your ship is destroyed and you're in your capsule. That doesn't necessarily mean you can do these things, as all those actions (with the exception of warping away) would also be prohibited by an active weapon timer. Being a criminal in low security space is practically the same as being a suspect, as long as you or anyone who assists you have no plans of jumping into high security space for the next fifteen minutes. Jumping into or undocking a ship in high security space as a criminal will allow you to benefit from the session change timer invulnerability, but it only delays the inevitable demise of your ship. Even if your criminal timer runs out during the invulnerability, CONCORD will still follow through and destroy your ship, even though you're no longer a criminal when the invulnerability wears off. Hovering over the limited engagement icon will show all current engagements, the pilot's name and corporation as well as the time left. Cause: Involved in a limited engagement with 1 pilot (or any number of pilots). Consequence: These pilots may freely engage you while timer is active (5 minutes). A limited engagement is a permission between two pilots to freely engage each other or their assets in combat without interference of CONCORD. Limited Engagements are created on attacks towards other pilots that are under a suspect or criminal flag to allow them to defend themselves, but can also be gained from accepting a Duel Request (see Duels & Limited Engagements for more information). As long as a limited engagement is active, the involved pilots may freely engage each other, including attacks on capsules or any other assets. Any other pilot interfering in the combat between two pilots with active limited engagements, such as using remote support modules on one of the parties, will receive a suspect flag for the interference. Naturally in null security space or wormhole space, where you are allowed to freely engage anyone at any time, there would be no legality issues and no timers apart from the combat timers would be created in the first place. Whenever you remotely assist someone, you will automatically inherit all the combat timers of the one you're assisting. Using remote assistance to aid a suspect or an outlaw is usually a Suspect offence and assisting criminals is a Criminal offence. Interfering in a fight between two parties (war or limited engagement) in high security space is a Criminal offence but only a Suspect offence in low security space. Even Command Bursts are affected by legality in high security space, removing the benefit of fleet members in high security space if they involve themselves as third parties to wars or limited engagements. There are several other timers in the game, most visible but some are hidden and will only show you an error message when you attempt something that cannot be done. The Session Change Timer is displayed in the top left corner of your screen and you can mouse-over the icon to show the exact time remaining on the timer. Jumping through a stargate, wormhole or jump bridge. Joining a fleet or moving to a different command position within that fleet. Leaving your ship, either through ejecting or having it destroyed. Performing a clone jump or a clone swap. As long as the SCT is active it prevents you from doing any of the things that cause a session change (i.e. anything on the list above) and will give you various error messages depending on what you're trying to do (often highly amusing error messages). While some session change actions performed during an existing session change will simply fail, others will be queued up and will follow through one at a time once the session change is over. You're scouting low security systems in a covert ops ship for a fleet and the fleet commander moves you to another wing or squad without telling you. This gives you a Session Change Timer which will prevent you from jumping through the gate you just arrived on. Unfortunately there happened to be a hostile there, and because you were decloaked by the stargate, you are destroyed. So be sure to move when you have time to wait out the timer, and make sure you ask people if they can take a session change before moving them yourself. You're ambushed by war targets landing on a station and they destroy your ship. You try to dock up with your pod, but cannot due to having a Session Change Timer from leaving your ship as it's destroyed. Since you wasted time trying to dock up, the enemy promptly pods you as well. So be sure to warp away from stations, gates, citadels, wormholes etc if your ship is destroyed, because you will not be able to dock up or jump through immediately after. Whenever you undock from a station there's a hidden timer that makes you a ghost, for lack of a better word, for 30 seconds or until you move, activate a module or target someone. While in this ghost-like state you're practically "invulnerable"; you cannot be locked and cannot bump against other ships, intentionally or not. While most actions break this "invulnerability" you can still press Ctrl + Space to stop your ship (or use the – button on your HUD right next to your speed bar) while keeping your ghost-like status. This can allow you to undock, remain protected and wait out the Session Change Timer and dock back up before the "invulnerability" wears off. Be aware that there are stations, so called "kick-out" stations that have such a small docking range that even if you immediately stop your ship you'll be too far away from the station to immediately dock up again. For those stations you'd be forced to turn around and move back towards the docking ring, which will give the enemy ample time to lock and attack you. The Jump Cloak Timer is displayed in the top-left corner of your screen and you can mouse-over the icon to show the exact time remaining on the timer. The Jump Cloak Timer is a visible 60 second timer that keeps you cloaked after jumping through a stargate or a wormhole, as long as you take no actions after jumping through. Remember that jumping through a stargate or a wormhole will also give you the above mentioned Session Change Timer for 10 seconds. During the minute your Jump Cloak Timer is active, you'll not appear visibly on grid and you will be invulnerable to damage from such effects as bombs, smartbombs and ECM Bursts. During the effect of this timer it's also impossible to be decloaked by someone coming within 2000 meters, or bumped by ships occupying the same spot in space. While they cannot see your ship, there are many ways to know that someone entered or left the system. A wormhole or a stargate will have both a visual and audible notification that the wormhole was activated and if you're in known-space you will also show up in the member list of the local window as soon as you enter the system. You're jumping through hostile space and encounter a gate camp on the other side of a gate. You can now relax, calm down, run your directional scanner, appraise the composition of the gate camp and consider your options for the full minute of the Jump Cloak Timer. This will allow you to make a calm and tactical decision which will greatly increase the odds of you making it through the camp alive. Jump fatigue and jump activation cooldown are two timers that are relevant to ships that use jump drives or jump portals (i.e. via capital ships or blackops battleships). For a detailed description please see Jump Drives and Cynosural Fields. 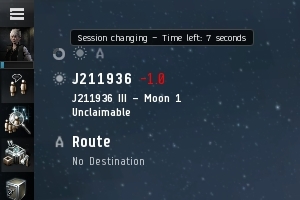 Whenever a character logs out while in space, there's a hidden 1 minute timer to removing that character and their ship from the game. The same applies to simply killing the client or crashing (although see the bug mention below). In combination with this timer the ship will try to do an "emergency warp" to a random location (1 million km away) where it will remain until the logout is triggered. The emergency warp will only be attempted once and is subject to normal warp disruption, so if the ship is warp disrupted at the time of the disconnect, the ship will not warp away but will continue to count down towards the potential logoff. Be aware that both the Non-Capsuleer and Capsuleer Log-Off Timer mentioned above will prolong this timer, keeping you in space for longer (even indefinitely in the case the capsuleer timer). Logging out or simply closing the client while docked is instantaneous and there is no delay (assuming the server gets the call from the client that you closed it). Bug: Sometimes when you crash or lag out, the server doesn't get the call from the client that you've disconnected. It can sometimes take a long time for the server to realize you're no longer there, delaying the emergency warp and 1 minute logout timer for several minutes which results in your ship being left out in space for much longer than intended. Turning on or have any active modules running. Aggressed by players or NPCs, ie having a Non-Capsuleer or a Capsuleer Log-Off Timer. Exploding or having initiated a self-destruct. Moving or initiating a moving command. Launching or ejecting anything from your ship's cargo hold or its bays and hangars. Being fleeted or joining a fleet. Deploying or having drones deployed or being in the process of reconnecting to them. Locking, being locked or having a lock on something. Issuing a warp command or being in warp. Being cloaked, including the Jump Cloak Timer from taking stargates or wormholes. Doing any of the above mentioned actions will not only stop you from initiating the safe logoff, but also cancel a previously activated safe logoff. To use the safe logoff you right-clck your HUD's capacitor and select the Log Off Safely option. If the requirements aren't met, an error message will be displayed to highlight the reason you cannot; in this case because you have active modules still running. When you initiate a safe logoff in space you'll see this window until you're safely logged off. You can make a maximum of 2 jumps through a specific wormhole in 5 minutes. If you try to jump a third time through the same wormhole inside those 5 minutes, you will receive a message informing you how long you have to wait before you can jump again. This timer doesn't apply to jumping through different wormholes. When you place or modify a buy or sell order in the market, you will not be allowed to modify that order or delete that order until 5 minutes have elapsed. While the timer does still exist, members can quit corporation even without waiting 24 hours after dropping roles by right clicking their portrait in chat and choosing quit corporation? and confirm quit corporation. If you choose to terminate one of the characters owned by your account, it will enter the recycling queue for a 10 hour waiting period. When the 10 hour timer expires, you can complete the termination of the character and re-use the slot for a new character. Log off mechanic threads here and here on the official Eve Online forum. This page was last modified on 14 April 2019, at 16:01. This page has been accessed 118,706 times.